RESEARCH TRIANGLE PARK, NC--(Marketwired - October 06, 2015) - Medical affairs is increasingly critical to operations at life sciences companies. While many medical affairs subfunctions must deal with static resources, medical communications teams -- medical education, medical information and medical publications -- are receiving budget increases at some companies. This growth in budget reflects how medical communications teams are adapting to technology's impact on the dissemination of medical information, according to a recent study by pharmaceutical intelligence provider Cutting Edge Information. The Internet has given patients and physicians easy access to medical knowledge -- but this data may not all be accurate. "According to interviewed executives, the biggest challenge for patients and caregivers is often differentiating between valuable and non-valuable online medical information," said Natalie DeMasi, senior analyst at Cutting Edge Information. "The availability of easily accessible online information may also dissuade physicians from seeking company expertise." According to Cutting Edge Information's newest report, "Medical Affairs Management: Igniting Innovative Global Strategies," 61 percent of surveyed teams have modified their existing medical operations in response to the challenges resulting from the Internet and social media. 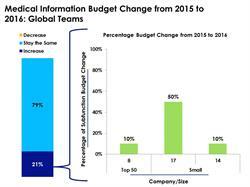 In tandem, 21 percent of global teams expect to increase their medical information budgets between 2015 and 2016. Other medical affairs subfunctions are experiencing changes. For example, medical publications teams have shifted operations to meet new industry transparency trends. These shifts include publishing negative clinical trial outcomes and a decreasing emphasis on impact factor when selecting journals. Similar to medical information teams, 20 percent of global medical publications teams predict budget growth from 2015 and 2016. For more information please visit http://www.cuttingedgeinfo.com/research/medical-affairs/global-resource-allocation/. According to Cutting Edge Information, surveyed teams anticipate that medical information budgets will remain relatively consistent from 2015 to 2016. While no teams report plans to decrease their budgets, 21 percent of global teams intend to increase their resources. Those increasing medical spending have products approaching launch window.